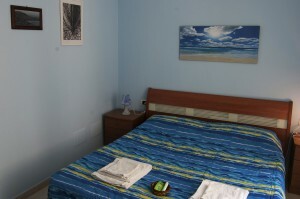 B&B Quattro Palazzi welcomes you in a relaxed atmosphere of warm hospitality, in the colorful and lively old town of Naples. B&B Quattro Palazzi lies in a strategic location: 10 minutes from the Central Railway Station and from the Port; very close to Neapolitan Universities; a step away from the old town and the main cultural and tourist places. 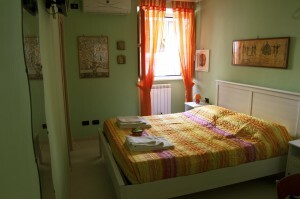 B&B Quattro Palazzi has 3 double rooms (queen-size bed), with en-suite bathroom, endowed with every comfort. Rooms are inspired by the beauties and the elements of the Neapolitan city: Sun, Earth, Sea. Rooms are very spacious and bright, furnished with taste and liveliness. All of them have air-conditioning, heating, LCD TV, sheets and towels. Each bathroom has a shower and a hairdryer. Mini-shampoos and mini-foambaths are for free. Every morning a rich breakfast is served into the leaving room or in the little terrace. Free wi-fi internet access is available for guests. Some guides and brochures of the city are at guests’ disposal to help planning the visits and to inform about the events. B&B Quattro Palazzi is the ideal place to have a wonderful holiday or a business trip; very convenient if you want to visit Campanian islands or Amalfi and Sorrento coasts. Price/quality ratio, warm hospitality and homely atmosphere will make your stay in Naples unforgettable.